TIF TALKS BOOKS: #30Authors Returns With Legacy: An Anthology! #30Authors Returns With Legacy: An Anthology! Do you remember back in September that I participated in an unique blog tour known as #30Authors? Over the span of 30 days, 30 authors shared their recent favorite reads on 30 different blogs. It was quite an unprecedented event, and I am excited to share with you all a collaboration that resulted from the #30Authors event. With The Book Wheel as yet another driving force, along with Velvet Morning Press and a handful of the authors from #30Authors, an anthology of short stories was born. Legacy, recently published, features 14 short stories, some of them fiction and others nonfiction that focus on what legacy means to the writer. Some of these stories were heart-warming, some heart-wrenching, but each one personal to the author and touching to the reader. A number of these stories really stood out to me, but I wanted to focus on three that really impacted me personally. Lesage's legacy piece transports us into the past through the eyes of a young child caring for her brothers during the era of World War II. To be honest, I am a sucker for anything written around this time period because it fascinates me, so it is no surprise that this short impacted me. I thought it was a sad, yet beautiful story and one that truly embraced what I imagined as a legacy and the importance of the little things passed down from generation to generation. Caroll takes a different approach to legacy through her short, "Forget Me Not." It takes you on a roller coaster ride, starting with anger and frustration (partly because you don't understand what is causing it) to sadness and regret to even smiles and warm content. It was ultimately a sweet story that closed with a sort of perfection (as odd as it may sound). Punches' story brings me comfort as it is opens around a grandmother and her granddaughter working on a quilt. The story that brought them together at that very moment is revealed to be a complex and difficult road, and the future is foreshadowed to bring something similar. However, the ending provides the reader peace and warmth despite these difficulties. Though I leave you with comments on only three of the tales within Legacy's pages, there is one story that I also believes an honorable mention for its creativity and execution: "Four Days Forever" by J.J. Hensley. Hensley writes about four powerful days in reverse order, starting with this unforgettable first line . . .
"A shotgun is a formidable weapon." Yes, yes it is. And, so is Hensley's pen! As with any anthology, I believe that a number of Legacy's tales were enjoyable, and there were a handful that did not work for me. However, as a whole, I love that it was a mix of fiction and autobiographical; a mix of entertainment and lasting words. Legacy is truly an impressive word to define these shorts, and what I loved most is how personal and different and unique they were to each of the individual participating authors. Thank you to Velvet Morning Press for a review copy of this book in exchange for an honest review. 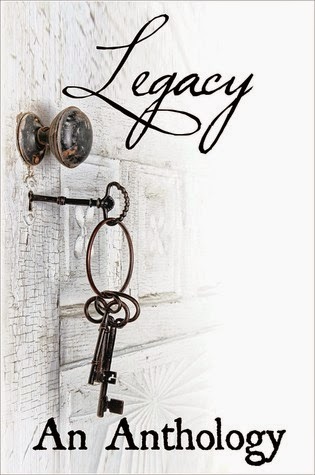 I encourage you to check out the full blog tour schedule in honor of the release of Legacy, including an upcoming author interview here at Tif Talks Books next week. If you do choose to purchase your own copy, all proceeds will go to PAWS for reading. Have you had the opportunity to read the shorts of Legacy yet? If so, which stories left a lasting impression on you? Adria J. Cimino ... You're welcome! I was fascinated at all the different angles it took! Thanks for the wonderful write-up! Thanks for reviewing the book! And I'm so happy you enjoyed my story. Writing about WW2 was a huge departure from my normal writing (anecdotes about my life in Paris) that I was nervous I wouldn't be able to pull it off! Vicki Lesage ... You're welcome! I'm so glad you took the plunge on this one. Your story is one that will stay with me for a while!